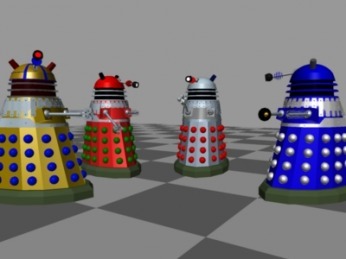 Here are some models of the Daleks seen in the first of the two Peter Cushing films. I always liked these daleks. So bright and colourful! Here are the Daleks seen in the second of the two Peter Cushing Films. These ones have slats which the 1st lacked. All the models on this page are all in figure forms so they are ready to use as soon as they are downloaded. 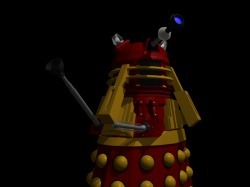 This is my model of the new series supreme dalek. It took a lot of work, and is not super accurate. I mean it looks good, but if you could scan in a real one into the comp, it would probably be better then this one! These are some of my favourite models to date. The Daleks that ruled the 70's! 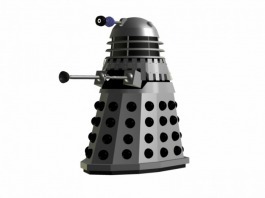 They are known as the Genesis dalek, the Chief dalek and the Supreme Council dalek. sort of like adding wheels to a tomato! 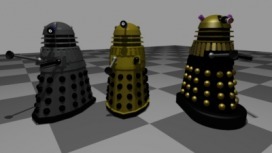 My New series dalek models. Unfortunately, most of my model download on this website will be in An8 format. This will only work with Anim8or, which is nice and free and can export files to different file types. It is so it can include the figure as well. It includes an ordinary Dalek and Dalek Sec. 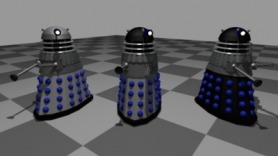 Some of my 60's style daleks with slats. With the three major designs of the time, looking pretty snazzy. Also included is the texture for the mesh, because it doesn't really work without it! All of my figures are for Anim8or only! But like I have said, Anim8or is a nice free program. And if you want you should be able to export your models if you want them for other programs. 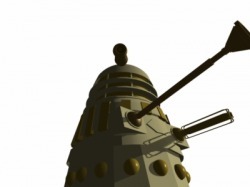 The last Dalek ever to appear in the classic series of Dr Who has now been made availiable for download! Sorry this one took so long, it just fled my mind for a good long time! I hope this dalek marks the birth of more Anim8or dalek films on YoutTube! These daleks appeared in the doctor who 70's episode; Death to the Daleks. I have now made my model a download, including the texture it needs (like many of my other models). Once again, I can't wait to see these models in more films on YouTube! These are the figures from 'The Dalek Saga' series. Included is the four shown and the textures that belong with them. 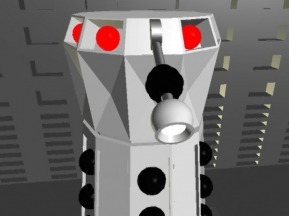 This is the emporer in his chamber as seen in episode 4 of the dalek saga. I would have uploaded more sets (just spent an hour trying), but I already have loads on this site, and at the moment, it is testing my computer. In a little while I should be fine though. So don't stop requesting models and sending me those lovely comments! I was asked by lots of people (you all know who you are) to put this model up. So I did. Enjoy it, there were many hours of work putting it together. If you want to see any more models here or any other things to download PLEASE send me a message on the contact page. I love hearing what you have to say and would be happy to add more downloads!